The phone rings, and the caller is really upset. Sometimes angry, sometimes tearful, sometimes sullen, but whatever the direction, the emotions are off the charts. Often it feels as though nothing can help them–nothing you offer has any chance of making a difference. We try to focus on facts, resolve their complaints, de-escalate the situation, find out where we can help, but often it goes nowhere. Why? Over the years, we’ve seen that callers need us to notice and support their feelings before they can tell us much about what caused the feelings–and that attempts to resolve their problems before addressing how they feel generally don’t work. If our goal is to help our customers feel better after working with us, we need a wider view than just straight problem-solving–because people need a chance to feel that their story has been heard, not just a chance to watch their problems disappear. This is Mike. He’s a regular guy, going about his regular life. Sometimes, Mike’s life takes a turn for the worse. Bad things happen to him. Actually, this is always happening. Life always shoots a few arrows at Mike, but he usually just plucks them out, sets them down, dusts himself off and keeps moving. Sort of the way most of us deal with mosquito bites: sure, they’re unpleasant, but they’re not that big a deal. But once in a while, Life gets feisty and starts shooting lots of arrows, or maybe Mike gets accosted by a roving band of archers. It starts to feel like Life has some kind of vendetta against Mike, and he gets knocked down. Once he does, he becomes an easier target, and he’s quickly hit again and again. Mike is now in crisis because Life has overwhelmed his usual coping skills. 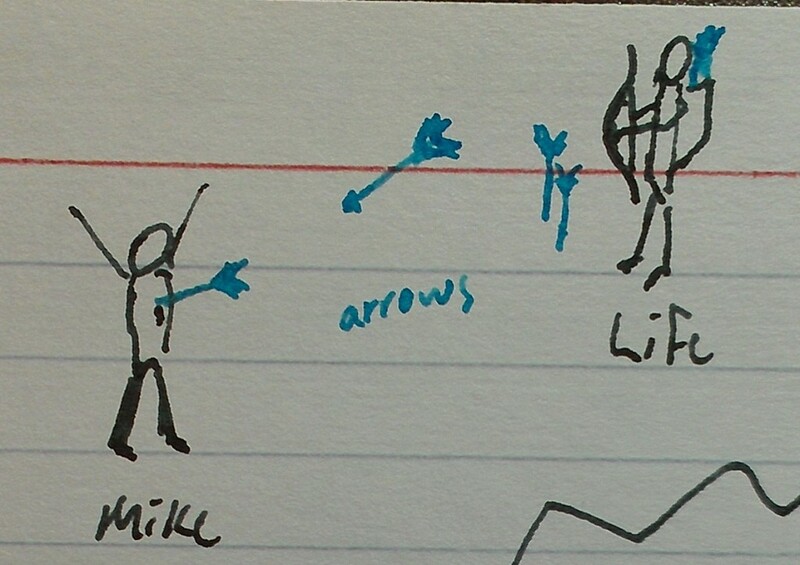 So Mike is lying on the ground stuck full of arrows like some horrifying porcupine from the battle of Agincourt. He’s in trouble, and the facts are bad: he’s got a whole lot of arrow wounds, he’s losing a lot of blood, and he’s vulnerable to further arrow wounds. Because of those things (facts), Mike develops feelings. He’s in a lot of pain almost as soon as the first arrow hits him, and before long he’s scared, and he’s mistrustful because (let’s be honest) Life is shooting arrows at him! 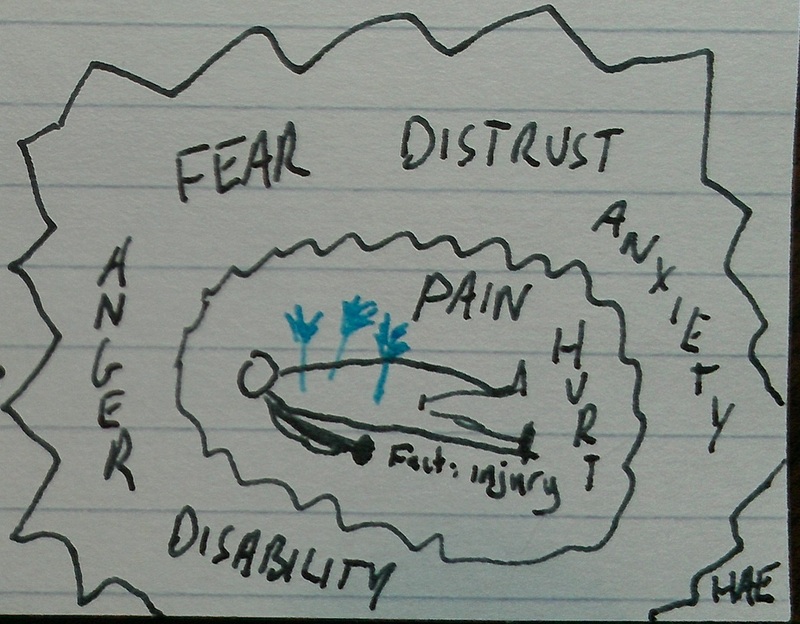 It doesn’t take long before Mike starts feeling a lot more emotions: anger at the people shooting at him, anxiety over whether this is how Life is going to treat him from now on, worries over whether he’s going to be permanently disabled, and on and on. 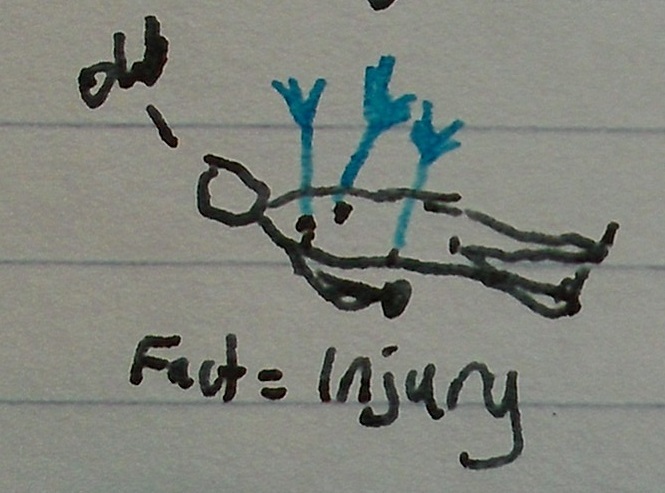 Notice that the emotions take up a lot more space and bandwidth than the original injuries did. They’re huge and overwhelming. Also notice that they totally surround Mike at this point. The feelings grow out of the facts, but eventually they become somewhat independent–not just offshoots, but factors in their own right. Remember that the person’s grief closet may be overflowing. We show up on the scene, ready to help, like some kind of psychological EMT, a customer service black belt, a total expert in problem solving, a living tribute to the arts of brief solution-focused counseling. Mike has some problems and we are here to solve them! Strangely, though, Mike doesn’t seem to want our help. It’s almost like he wants to stay injured, because we keep talking about the importance of getting him to a hospital, the possibility of investing in armor, maybe taking a different route to work, placating Life, whatever, but Mike keeps moaning and talking about how unfair it all is. Why can’t he just get with the program? We’ve got solutions for this stuff! People need to feel that you’ve heard their story. They need to feel confident that you’ve understood how they’re feeling, not just that you’ve accurately assessed their problems. If there are solutions to be found, our callers need to believe not just that we’ve understood the problems and proposed correct solutions, but also that we understand how they’re feeling and care about it. Until we’ve acknowledged their feelings, most callers aren’t ready to talk about solutions. This is true whether they’re calling a crisis hotline, talking to customer service at a big box store, asking to yell at a restaurant manager, or complaining to their Senator. So let’s start with the feelings. Reach behind the content (as my friend Pat Morris once said) toward the person. Honor how customers feel before you start digging too deeply into what the problem is, what caused the problem, or how you might be able to solve it. If you look at my drawing, you’ll see that it isn’t really possible to reach the arrow wounds without getting engulfed in the feelings, because the feelings surround everything. You have to start with the feelings because they’re the first thing you see. So start with the feelings! Here’s what that might look like in a crisis hotline context. The first call is based on standard problem-solving practice; the second call implements a start-with-the-feelings approach. Me: Hi, crisis line, can I help you? Caller: Uh… I hope so. M: What’s going on tonight? C: Well, I just got my electricity shut off tonight. M: Okay, I can help with that. When was your last payment due? M: Okay, and is this the first time your electricity has been shut off? C: No, it’s happened before because I lost my job a while ago, but then I got a new one and I thought it was going to be great, but not so much as it turns out. M: Okay, so you’ve had a history of non-payment. Have you been in touch with National Grid to see about setting up a payment plan? C: No… I didn’t know I could do that. M: Yep! If you’d like, I can get you their number–they’re still open for another two hours and you can probably reach them tonight. Often they’ll turn your power back on as long as you set up a plan where you’re paying them something each month–it’s not in their best interests to lose you as a customer. C: … okay. Yeah, can I have that number? M: Sure! It’s [number]. Is there anything else I can help you with tonight? C: … no. Thanks, you’ve been really helpful. M: Thank you! Please feel free to call back if there’s anything else you need. This is decent work for what’s basically an information and referral (I&R) call. We hear about a problem, we ask a bunch of clarifying questions, and we provide meaningful referrals that have a genuine chance of helping with the caller’s situation. It’s straightforward and fairly quick, and the customer sounds satisfied. My concern is that we can do better. The referral is good, but we have more to offer to this caller, to turn good service into great service. M: I’m sorry to hear that–what happened? C: Well, I was two weeks late on my payment again, and the same thing happened a few months ago so I guess they just gave up on me. M: Sounds like you’re feeling pretty bad about that. C: Yeah. I mean, I know it’s important to pay on time, I get that, it’s just that I’ve been dealing with a lot and I… I just lost track of it. M: Sounds like you’re feeling pretty overwhelmed. What else is going on? C: My kid’s been in the ER a lot. Nothing serious, just ear infections, but I haven’t gotten much sleep because I’ve been worrying or sitting in the ER most nights. I get home at like 3am and then I hope to God I get a little sleep before I have to be at work the next day, and it’s just like there’s no time. M: I’m so sorry–that’s a lot to manage! C: Yeah, so… I dunno, I know there’s probably stuff I can do about the power but I just feel so overwhelmed by it. M: I’ve got some ideas about that, if you’d like them. C: That would be great. M: Have you been in touch with National Grid to see about setting up a payment plan? M: Basically, they want to keep you as a customer, so they’ll often turn your power back on as long as you set up a plan where you’re paying them something each month. They’re usually pretty understanding about it when it’s based on things like a sick kid. C: Okay, that sounds great. Can I have that number? M: Yep! They’re still open for another two hours and you can probably reach them tonight. While I’m looking that up, how are you feeling right now? Any different from when you called? C: Yeah… I feel like I can do this, like it’s not going to be as awful as I thought. M: I’m so glad! That number is [number]. Would you like to talk more with me, or would you rather call them right away? C: I think I’d like to just call them, but thank you so much for listening. M: You’re so welcome! Please feel free to call back if there’s anything else you need. In many respects, this is the same call, but I hope you’ll see that the quality of the interaction is greatly changed. It takes a little longer, yes, but it’s better in pretty much every respect except for the metrics related to call times and calls per hour per agent. In this case, we led to the same outcome as in the first call, but we also have enough information that we could offer additional referrals if the caller wanted them. When we’re looking in from outside at the people we help, the first thing we reach is feelings. They surround the facts, shrouding and hiding them. If we skip the feelings and dive straight into the facts of the matter, at best we miss an opportunity to transform adequate service into excellence. At worst, we miss the point. If we focus on the facts, it becomes clear that the facts are the most important thing to us–sometimes more important than the caller. Start with the feelings and you make it clear that the relationship–your rapport–is what matters most to you. Once you’ve established that, the callers will usually lead you toward what they need to talk about. This is part of a series of posts musing on what goes into good customer service and support in a crisis hotline, good caller care, and the underpinnings of excellence in call centers. I like to think about stuff, and I hope you’ll join in. 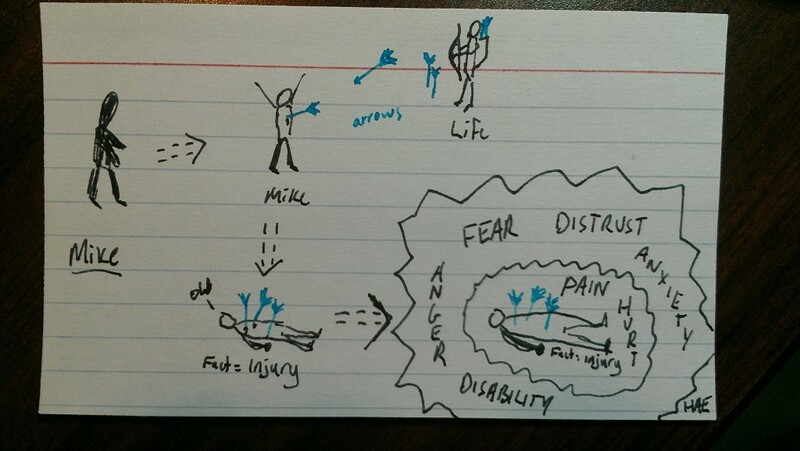 I also enjoy drawing pictures on index cards–try it! Thanks to Shye Louis for reminding me overtly that crisis center work is customer service (“Give ’em the pickle!”) and to Pat Morris for the idea of reaching behind the content. And thanks to you for not laughing too hard at my drawings. 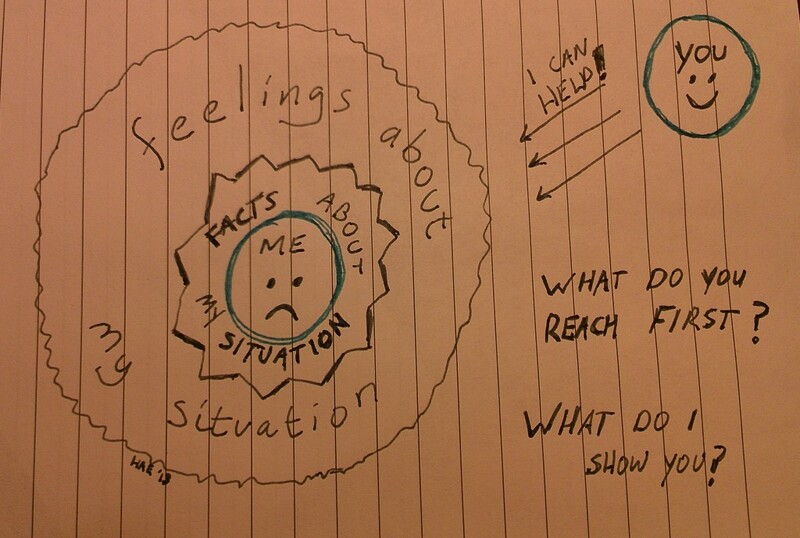 How do you integrate starting with the feelings in your work? Leave a comment or a question, please! I’d especially love to hear from people who don’t work in crisis hotlines. Where else does this apply? Leave a comment! Agreed. With students I find myself using things like “Wow, that sounds really frustrating/upsetting/etc” “I can understand why you would feel like that” “I’m really sorry, that is so sad/crappy/etc” to empathize.. and “It sounds like you’re frustrated about X” “If I understand you right, the part of it that is really bothering you is X” to make sure I’m understanding things correctly. Then we work together to brainstorm ways to fix it, when/if they’re ready for that. I think this has a lot of application for the medical field as well. As a doctor-in-training, this is the kind of philosophy that medicine is currently adopting, and would enhance doctor patient relationships so much if every physician worked in this way. Mental well-being = physical well-being. You can’t have one without the other. Leah, I’m thrilled to hear that the medical world is changing and moving toward this sort of model. My experience of doctors has often been negative because they don’t seem to listen, and I’m so glad to hear that that’s changing. This strategy can also work in IT, since people tend to have an emotional relationship with their computers. However, it is often not the approach taken in IT because the problem space tends to be a more logical and problem-solving one.